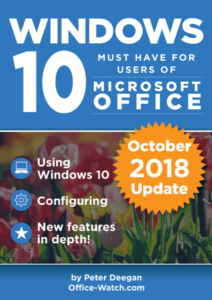 Various ‘news’ stories going around promising a trick to getting Office 2019 for free … don’t believe it. We know a way to get Office 2019 cheap, but not free. Maybe these ‘Office 2019 for free’ stories are deliberate clickbait or horribly ill-informed, either way they’re quite wrong. As often happens these days, ‘Office 2019 for free’ seems to have started with one story that gets copied to other sites with no checking. Office Online is the browser based version of Word, Excel, PowePoint and OneNote. Any computer or device with an internet connection and modern browser should work with Office Online. Word Online, Excel Online, PowerPoint Online and OneNote Online have a basic range of features. Not everything that’s in Office 365 for Windows, but usually more than enough to keep you going. These browser-based versions of Office are a useful standby on any Windows or Mac computer. If the Office software crashes, keep going with Office Online. The Office apps for Android and Apple devices are free for everyone on devices smaller than 10.1″. In practice that means most tablets except the larger ones like the iPad Pro range. On devices over 10.1″, you need an Office 365 subscription to activate the apps. Under 10.1″ devices do not need an Office 365 subscription to make the apps work. However, some additional features are available with a subscription. Employees can get Office 2019 for just US$15 if their organization has an Office volume licence including Software Assurance. < Get Office 2019 for just $15 > Office 2019 Professional Plus from Amazon for under $50?